Chennai: Edappadi K Palaniswami, nominated for the top post by convicted and jailed AIADMK leader V K Sasikala, was today sworn-in as the Chief Minister of Tamil Nadu. With todays swearing-in the fate of caretaker Chief Minisetr O Panneerselvam, who had revolvted against Sasikala, has been sealed. Governor C Vidyasagar Rao administered the oath of office and secrecy to Palaniswami, a senior AIADMK leader from western Tamil Nadu. He will head a 31-member Cabinet. The ministers were also sworn-in at the swearing in cenermony at Raj Bhawan this evening. 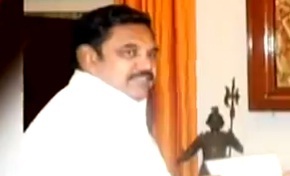 Palaniswami was invited today by the Governor to form the government. He had submitted a list of 124 MLAs, who were siupporting him last night. He has been 15 days to prove his majority in the 234-member Tamil Nadu Assembly.